Are you so tired and burned out that you feel life is running you instead of you living it? 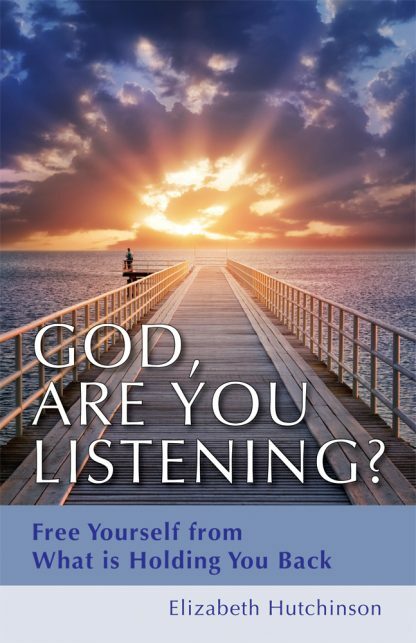 Have you lost faith in yourself, in your life, and in God? Elizabeth draws on a number of techniques from psychology to spirit-centered disciplines bringing all aspects of mind, body, and spirit practice together to form a comprehensive healing path. She shares insightful stories that help build self-esteem and self-worth, she illustrates the power of word therapy, and how being in nature or listening to music can contribute to therapeutic growth. And a good deal more. At the end of each chapter, she provides exercises for further study. Elizabeth writes, �Be gentle with yourself and know that you will still have some �bad� days. You will snap at your spouse or your children or have limited patience with the sales clerk or you may feel lonely. Old patterns are difficult to break, but the more you persist the easier it becomes. As soon as I give it over to God I find instant peace." In God, Are You Listening?, you will find a thoughtful and encouraging teacher who will help you to find the joy, love, and peace each of us deserves. Elizabeth Dillman-Hutchinson was born in Truro, Nova Scotia and lived there until the age of twenty when she moved west to Alberta. In 1994 she moved to Williams Lake, British Columbia where she has remained ever since. She is very happily married with a supportive family that includes many nieces and nephews. Elizabeth worked in the social sector for eighteen years as a Life Skills Coach, Employment Counselor, and Victim Services Practitioner. She is a member of the Canadian Alliance of Life Skill Coaches and she is currently working on her degree in Holistic Theology at AIHT. Elizabeth enjoys scrapbooking, being with family and RV'ing.